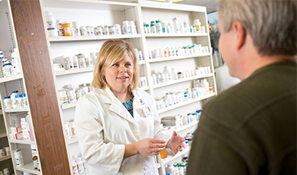 Another service offered by DeKalb Health PharmaCare, Hormone replacement therapy (HRT) is prescribed for menopausal women whose estrogen and progesterone levels have decreased. Most commonly administered as an estrogen/progesterone combination, patients can start HRT as soon as menopausal symptoms begin – from their early forties to well into their sixties. To learn more about hormone replacement therapy, talk to your family doctor or consult with your OB/GYN. DeKalb Health PharmaCare will work in conjunction with your physician to provide this therapy. To learn more, call DeKalb Health Pharmacare at 260.925.8000.